BMW issued a statement this morning announced the vehicle slated as the “new top performance model 1 Series for 2013” in the form of the new BMW 135is – a compact 2-door coupe and sedan packing more power and enhanced performance measures compared to the 2013 BMW 135i. The heart of the 2013 BMW 135is is the same TwinPower Turbocharged 3.0L inline-6 engine found in the 135i but in “is” form, the N55 engine has been tuned to make 320 horsepower and 317lb-ft of torque – improvements of 20 horsepower and 17lb-ft of torque over the 135i. This has been achieved in part by adding a performance exhaust system and helping to keep this higher performance engine cool is an enhanced radiator fan and an auxiliary radiator. This engine sends the power to the rear wheels via a standard 6-speed manual transmission or an optional 7-speed Double Clutch Transmission (DCT). The rear differential in the 135is features a new final drive to make for a perfect blend of smoothness, performance and fuel efficiency with double helical ball bearings allowing for less differential fluid. This allows the rear diff to reach optimal temperatures more quickly while also having less fluid weight in the vehicle. BMW hasn’t stated exact performance figures but we should expect that the 135is Coupe will best the 5.0 0-60 time of the 135i as well as beating the 130mph top speed. More importantly, these performance increases to the 2013 BMW 135is Coupe and Convertible come without compromising fuel economy or emission levels compared to the 135i. This means that the 135is Coupe should offer 20mpg around town and 28 on the highway when equipped with the 6-speed manual transmission while the 7-speed DCT 18 around town and 25 on the open road. The 135is Convertible should offer 17 miles per gallon around town and 26 on the highway, whether equipped with the manual or dual clutch transmission. Next, the 2013 BMW 135is is equipped with a unique sport suspension package featuring a lightweight aluminum double pivot front design and an equally lightweight high strength steel five link independent suspension system out back. The BMW Dynamic Stability Control system (DSC) includes a Dynamic Traction Control function (DTC), both of which are specially tuned to provide optimal acceleration in a straight line in through the twisties to keep the car pointing straight ahead – whether the driver is in great conditions, rain or snow. Also, both of these systems can be disabled for the rawest form of high performance driving in the 2013 135is. Finally, the BMW 135is comes with some dress-up features to allow it to stand out like a proper BMW performance model. First, on the outside BMW has added unique 18” wheels, gloss black dual kidney grille openings, black mirror caps, special exterior badging and standard M Sport Package exterior items including dual polished exhaust tips. Inside, the BMW 135is sports stainless steel pedals (a stainless steel footrest with the M logo for dual clutch models), special badging, and black leather with blue stitching on the standard sport seats. 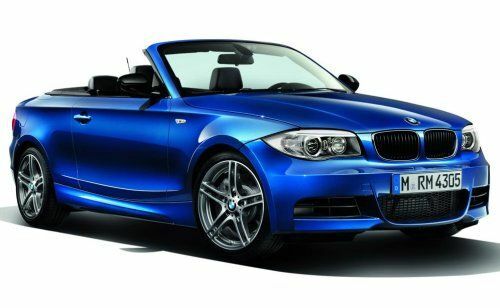 The 2013 BMW 135is is available for order right now with the 135is Coupe starting at $44,145 while the 135is Convertible starts at $48,845 – both of which include the $895 destination fee. With BMW calling this new model the “new top performance model 1 Series for 2013”, we can surmise that there may not be an M model for the 2013 1 Series Coupe or Convertible. We knew that the awesome BMW 1 Series M Coupe was a one year deal but it looks as though BMW lovers will have to wait until the revised 2014 BMW 2 Series hits to get their hands on the latest high performance compact M model. Click here for more information on the upcoming 2014 BMW 2 Series, including a look at the possibility of the new BMW M2 compact coupe and convertible as the BMW 1 Series becomes a sedan and 5-door model for 2014. Check out the 2013 BMW 135is Coupe and Convertible in the gallery on the right by clicking any of the thumbnails. The 1-series will also have a hatchback and an M-edition. It seems one of the car models of BMW cars collection. It will be quite interesting to collect some information about this car model.